I thought it was time we shared our secret ingredient for surviving the holidays. So pour yourself an eggnog, grab a snickerdoodle and put your feet up for a much needed rest. If there’s ever a time we deserve a little self pampering, now is it. So enjoy…. and perhaps add a dash of spiced rum. In a large bowl, beat or whisk the egg yolks until they lighten in color. Gradually add the ½ cup sugar and continue to beat or whisk until it is completely dissolved and the yolks are fluffy. In a saucepan, over high heat, add the milk, cream, and nutmeg and bring to a boil, stirring occasionally. Remove from the heat and gradually add the hot mixture into the egg and sugar mixture, whisking constantly. Return mixture to the pan and cook for 20 to 25 minutes, stirring often. Do not leave to simmer. Remove from the heat. Quickly strain into a bowl and stir in the bourbon or rum. Pour into a mixing bowl, and set in the refrigerator to chill. In a medium mixing bowl, beat the egg whites to soft peaks. With the mixer running gradually add the 1 tablespoon of sugar and beat until stiff peaks form. Whisk the egg whites into the chilled mixture and serve. Garnish with nutmeg. Preheat the oven to 400 degrees F. Line baking sheets with parchment paper and set aside. Sift together the flour, cream of tartar, baking soda and salt into a small bowl. In a large bowl, combine the butter, shortening, 1 ½ cups sugar. Beat thoroughly with an electric mixer on medium speed until light and fluffy, about 2 minutes. Add eggs and beat until creamy and well combined. Add the dry ingredients, and beat until combined. In a small bowl, stir together the remaining ¼ cup of sugar with the cinnamon. Shape the dough into 1 ½-inch balls (1 tablespoon per ball), and roll in the cinnamon sugar. Arrange the balls approximately 2 inches apart on baking sheets. Bake two sheets at a time until the edges of the cookies are set but the centers are still soft (they will not brown), 8 to 10 minutes, rotating the sheets halfway through. Transfer the sheets to wire racks to cool for five minutes. Repeat with the remaining dough balls. Store in an airtight container for up to a week. 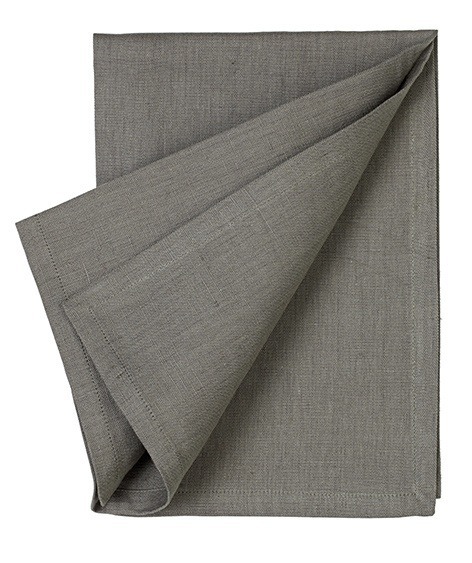 Shown with Linen Union grey napkin from étoile home and plate from Anthropologie for similar visit us at Main & Mersey Home Store.